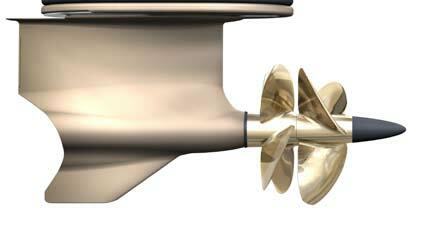 Forward-facing propellers with no exhausts through the hub, minimize the hub diameter. This gives a proportionally much larger active blade area in the water. This is one of the secrets behind the unbeatable efficiency of the Volvo Penta IPS system. 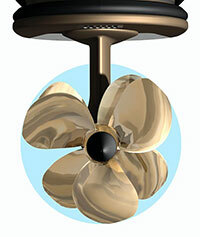 The twin counter-rotating propellers face forward, working in undisturbed water. The propeller thrust is parallel with the hull. All power drives the boat forward. All exhaust fumes are emitted through the pods, into the propwash and carried well behind the boat. The propellers are positioned well under the hull to eliminate the risk of air intrusion and cavitation, even in sharp turns and under full acceleration. Steerable pods point the entire thrust in the desired direction. This gives immediate response and totally predictable handling.